Boxers are predisposed to suffer from a heart condition known as boxer cardiomyopathy. According to veterinarian Wendy Wallner, boxer cardiomyopathy is a disorder of the electric impulses of the heart, which causes the heart to beat erratically. Most boxers may not show any symptoms until the disorder is severe. Unfortunately, serious cases can lead to fainting and even death. 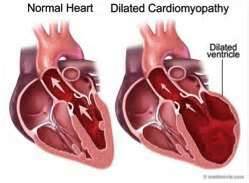 This condition cannot reliably be detected by listening to the heart with a stethoscope or with the typical 15 minute ECG. Wallner recommends having a 24 hour holter run on your boxer at the ages of 1, 2 and 5. The recommended protocol for screening boxers for Cardiomyopathy is to hook your boxer up to an ECG monitor for 24 hours. Since this condition can manifest at any point in life, best practices would be to run this screen annually from a young age until passing. Gentry Boxers have 24 hour holter monitoring sessions annually and their results are published on our web site. We currently use a digital Medata monitoring system with a DogLeggs vest and a printer that allows us to print results immediately. The OFA does not have a publishing database for Cardiomyopathy at this time, so prospective owners should ask for documentation of holtering sessions. To date, we have had no positive screens and no reported cases of cardiomyopathy in our breeding program. In 2009, a mutated gene was discovered that causes ARVC by Dr. Kathryn Meurs, DVM, Ph.D. She had been studying the causes behind this fatal disease for 12 years. Boxer breeders were very excited about this discovery and many of us now routinely screen our dogs for this gene. However, Dr. Meurs states "It is highly likely that there is more than one mutation in the boxer dog that will cause this disease in some bloodlines". This gene test is not the solution, but a valuable tool for a breeder to make wise decisions about which dogs to use. Negative Homozygous (2 copies of a normal gene). Dog does not carry the mutated gene. To date, all Gentry Boxers have tested in this category. Positive Heterozygous (1 copy of the mutated gene and 1 copy of a normal gene) Dogs that are positive heterozygous should be carefully evaluated for signs of disease (Holter monitor and possibly an echocardiogram). Positive Homozygous (2 copies of the mutated gene) I recommend not breeding the homozygous dogs UNLESS they are exceptional members of the Boxer community and we need to be sure to maintain their positive attributes in the breed. Dogs that are homozygous for the mutation appear to have more significant disease and will certainly pass on the mutation therefore they should only be bred to a negative dog and over 2 generations of negative crosses a negative puppy could be selected as a replacement.